September 25, 2014 /0 Comments/in Piano /by Megan L.
Think only rock guitarists burn their instruments? Or that flying performances are reserved exclusively for singers playing Peter Pan? Think again! These famous piano players are breaking all the rules with their unbelievable performances. Pianist Yosuke Yamashita wanted to create a performance that would capture his passion for the piano. So, in the course of this nearly 10-minute performance, his piano was set on fire and he played until the strings are burned out and will no longer make sound. In the video above, he starts playing at about 3:10. Though it is hard for some to watch the piano burn, it is an incredibly powerful visual statement of Yamashita’s love for the instrument and his drive to get the last notes out even as he coughs on the smoke. Start learning how to read notes & play your favorite songs in one of our FREE piano classes! 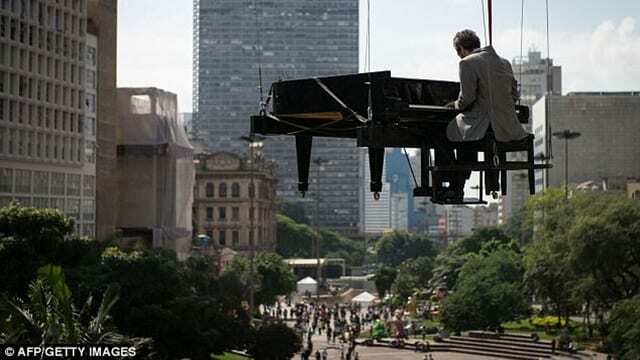 In 2012, adventurous Brazilian pianist Ricardo Nogueria de Castro Monteiro performed on a piano suspended “tens of metres” above the earth. As part of the Virada Cultural festival, he played once at sunrise and again at noon. Seeing the large instrument flying through the air must have made this a magical day! This piece by John Cage is written with the tempo “as slow as possible” as the only guideline. Performances of the piano version generally clock in around the 20-minute mark. However, at St. Burchardi church in Halberstadt, Germany, an organ is playing this piece slower than you ever thought possible. The organ began playing in 2001 and the final note will not be heard until 2640. The Piano Guys, known for their viral YouTube videos, took their gorgeous piano and cello duet all the way to the Great Wall of China for a performance that will give you goosebumps. The beautiful music and scenery in their videos make these famous piano players absolutely unforgettable. If you’ve ever played “four-hand piano” (AKA a piano duet), then you know how much fun it can be to share a keyboard with a friend. Imagine how much fun these eight pianists must have had! Not a note is out of place, which is very impressive considering the speed and complexity of the composition. What’s the most unforgettable piano performance you’ve ever seen? Who are your favorite famous piano players? Let us know in the comments below! Search thousands of prescreened teachers for local and live, online lessons. Sign up for safe, affordable private lessons today!